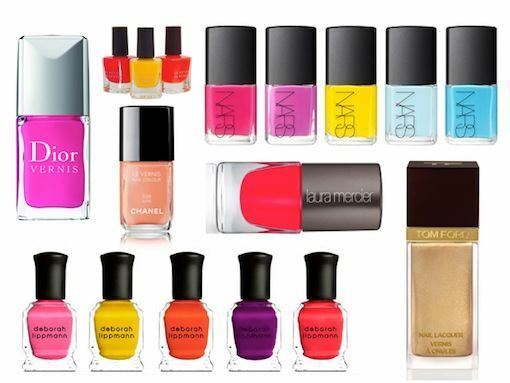 Summer Nail Trend 2012 | Couture Makeup Blog - Makeup Artist Serving San Diego and Orange County. Hello neon! Summer is welcoming bright and electric colors to come out and play this season. If you’re not ready to go all-out with the trend — but would still like to incorporate it into your look — this is a great option for you. Elle Magazine claims that ‘brighter is better’ this season. However, you don’t have to be covered with neon hues from head to toe to be able to enjoy these show-stopping colors. Instead, take it down a notch by using the colors in small servings to complement your neutrals. The idea is to incorporate the electric colors as accents to spice up your usual style. As much as I like the fun and carefree trend, I prefer not to stop traffic by wearing the equivalent of an orange street cone. For me — the classic girl — nail polish is just the right amount of neon. Pictured below are some great options! Cheers to a very bright summer in fashion!